Europe Air Source Heat Pump Market size will surpass USD 7 Billion by 2024, as reported in the latest study by Global Market Insights, Inc. 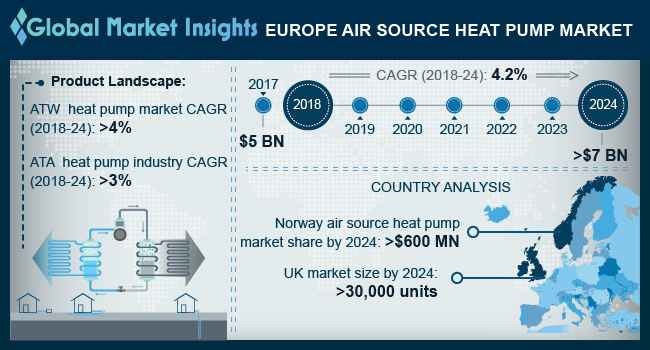 Escalating demand for hot water and space heating across cold regions coupled with shifting trends toward installation of high efficiency heating systems will propel Europe air source heat pump market growth. Furthermore, the government initiatives encouraging modernization and renovation of existing infrastructures along with financial aid for construction of minimum energy requirement buildings will enhance the business growth. For instance, in 2018, the European Investment Bank approved funds of approx. USD 115 million in support for construction of zero energy buildings. The UK air source heat pump market size is predicted to reach over 30 thousand units by 2024. The industry growth is majorly driven by the recent extension in the Renewable Heat Incentive (RHI) tariffs along with strengthening initiatives of utilities toward inflating the size of the national heat pump industry. In addition, the European Union in collaboration with the respective government introduced energy efficiency measures which will encourage extensive replacement of conventional heating units. Commercial air source heat pump market size is anticipated to grow over 4% by 2024. Escalating demand for HVAC units which are easily integrable with conventional heating systems along with rising infrastructural investment will propel the industry growth. For instance, in 2017, the European Investment Bank signed a deal with Infranode worth over USD 98 million for investment in development of sustainable local infrastructure. Regulatory measures promoting adoption of energy efficient space heating systems coupled with legislative initiatives favoring energy conservation will stimulate the ASHP market growth. Green building standards & codes along with rising focus for replacement of conventional heating units will further complement the business growth. In 2018, the European Union introduced Energy Performance of Buildings Directive (EU) 2018/844 with an aim to strengthen energy performance for new infrastructure and installation of energy efficient systems. Norway air source heat pump market size is anticipated to surpass USD 600 million by 2024. Rising investments toward sustainable development of commercial and residential sector will fuel the product demand. For instance, in 2016, Enova, Ministry of Petroleum and Energy introduced energy efficiency scheme with an aim to provide investment in form of financial aids for energy recovery measures in residential sector. Europe Air to Air (ATA) heat pump market size is predicted to expand over 3% by 2024. Ability to purify air, cost effectiveness, ease of installation, energy efficiency and zero expenses for ground works are some of the prominent features that will make product adoption preferable over the traditional counterparts. Furthermore, these systems offer consistent comfort on account of their ability to adjust control heating and cooling. Key industry players across Europe ASHP market include Bosch Thermotechnology, NIBE, LG Electronics, Carrier Corporation, Vaillant, Panasonic, Mitsubishi Electric Corporation, Viessmann, A.O. Smith, Daikin, Johnson Controls amongst others.